One of the fastest growing trends in the consumer market is personalization, especially as the holiday season grows nearer. Studies show that children begin to develop their own sense of style and personality in early-mid childhood. Encouraging this helps develop a child's sense of self and confidence. Canadian company, StickerYou, is helping children do just this by providing the platform and design tools for children to create their own identity for their space. StickerYou's Signature Wall Decals sales are quickly escalating, proving to be one popular gift for the season. These aren't your typical wall stickers, these custom wall decals are something you and your child can design together. Unlike other crafts or projects, creating a custom wall decal is done completely online from your own computer. No trips, no messes, just fun. Simply go to StickerYou.com and find the wall decals webpage. Choose the first letter of your child's name. Each letter has 6 different patters you can choose from. Once you have selected a pattern, choose your colors. You can change the background and foreground colors to create a variety of different looks. Each custom wall decal is created on a high quality durable material and contour cut around the edge of the design. They have a strong adhesive which will adhere well to walls but can be removed without causing any damage. Easy on, easy off, no fuss, no muss. The variety of colors and patterns means you can match the decals to the colors and decor of your child's bedroom. Also, unlike traditional personalized wall decals, you type in the name yourself. 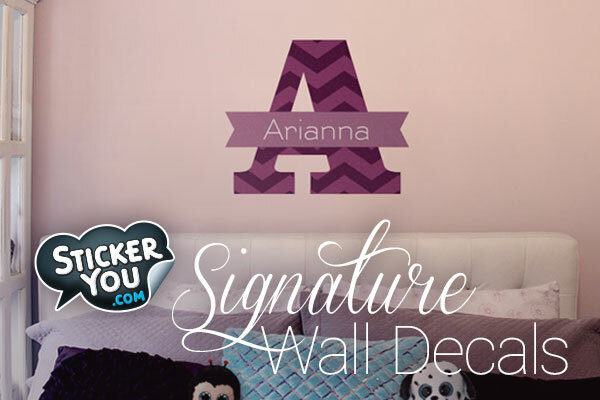 So even if your child has a unique name, or spelling, you can create a personalized wall decal that will suit them. These vinyl wall decals are perfect for children of all ages. they can be used to decorate a new baby's room with his or her name above the crib. Young children can confidently show off their own space with a personalized wall decal they helped design. If your household has siblings that share rooms, you can decorate above each bed with custom name decals that will suit each of them. The decal are also an easy way to make dorm rooms feel a little more like a home for college students. Signature Wall Decals will also stick perfectly to smooth doors. Create custom decals for each bedroom to mark their spaces. These personalized wall decals also look great in front halls or among frame galleries. Simply add your family's last name instead. The wall decals can be removed which makes them great for seasonal decorations as well. Check out our Signature Wall Decals to start yours or watch our tutorial on applying and removing all decals!